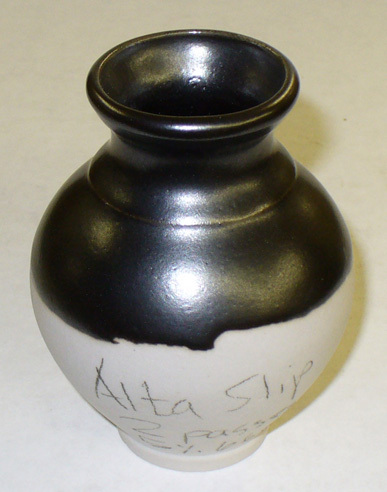 Alberta Slip is a great base for black glazes at cone 10 reduction, only 1% black stain is needed to obtain a jet black glossy. 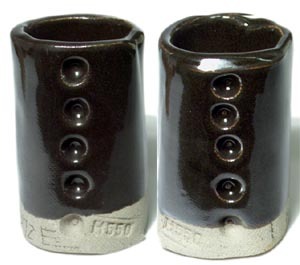 Increasing amounts of stain up to 5% move toward a matte black for Mason 6600 (they remain glossy for Mason 6666). 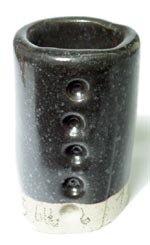 Adding 5-10% black stain and 5-7% iron produces a crystalizing intense gunmetal black. Mixtured additions of Mason 6600:6666 (e.g. 1:1, 2:2) produce metallic surfaces. Like other high-percentage Alberta Slip glazes, you must use a mix of calcined a raw powder. See the preparation page at http://albertaslip.com for more information. A jet a black glossy glaze for cone 10R is as easy as 1% black stain and 99% Alberta Slip (Mason 6666 or 6600). Of course, the 99% is a mix of calcine and raw material (starting at 50:50). This is a 50:50 mix of calcine and raw Alberta Slip plus 5 parts Mason 6600 black stain, 5 Mason 6666 black and 7 iron. A 50:50 mix of raw and calcined Alberta Slip with 5% Mason 6666 stain added. The slurry was ball milled. Fired at cone 10R. Alberta Slip (50:50 calcine:raw mix) with 1, 2, 3, 4 and 5% added Mason 6666 black stain. Fired at cone 10R. Semi-gloss blacks are produced. Increasing stain percentage above about 3% does not darken the color appreciably.